Dreamspinner celebrates Easter with discounts for next 48 hours! In other news, The Boys of Summer is completed and in editing, and the wonderful Reese Dante is designing a cover. I’m so excited about this one, guys! It’s like I keep getting hints of a wonderful birthday present to come! I can’t wait to share it with all of you! I’m looking at a early May release date for The Boys of Summer, as I will be attending Galacticon 3 and its sister convention, ComicPalooza, May 23-26th in Houston. We’re going to have SUCH a blast! 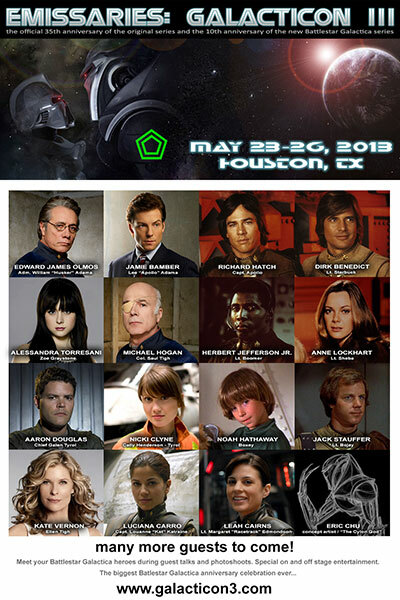 Galacticon is a once-every five year convention celebrating Battlestar Galactica in all its forms, and this year, it is the 35th anniversary of the original series! Fellow author Anna Butler and editor/metalworker/jewelry maker Jennifer Roberson will be co-hosting a panel discussion with me on fanfic as well as a writing workshop. Have you seen the guest list for these conventions? (Patrick Stewart! James Edward Olmos! Cary Elwes! Avery Brooks! Peter Davidson! I could go on and on, really, check the links!) The activities planned? OMG, this is going to be HUGE. If you can possibly make it, you should come! We’d love to see you! This entry was posted in Uncategorized and tagged announcements, Battlestar Galactica, discounts, Dreamspinner Press, Peggy Carter, Sarah Madison by Sarah Madison. Bookmark the permalink. The writing has been going really well for me lately, despite work being very stressful! I’m like a child at Christmas–only this time I can’t wait to share things with you guys! Sarah Madison recently posted..Dreamspinner celebrates Easter with discounts for next 48 hours!